On 31 October 1944 the U.S.S. KETE departed Pearl Harbor to begin her first patrol. On 10 March 1945, during her second patrol. she sank 3 vessels totalling 6,881 tons. She earned the Asiatic-Pacific Area Service Medal and 1 Battle Star during her 2 patrols. On 20 March 1945 the KETE transmitted a special weather report and was never heard from again. On 16 April 1945 she was presumed lost. It is believe she was sunk by a Japanese submarine. Eighty-seven brave submariners perished on the KETE. Fifty-two American submarines were lost during World War II. The U.S. Submarine Veterans of World War II have assigned one of these lost submarines to each state. (Two were assigned to both California and New York.) The U.S.S. KETE was designated the Delaware state boat. A list of the men lost while serving on USS Lagarto. Includes a memorial page and photo of each submariner. The U.S.S. Kete (SS 369) marker is on the left. probably at the time of her completion. 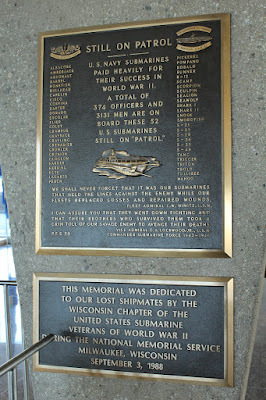 to submariners who lose their lives in World War II.